We have three cats now, Princess, Misty and a new kitten, Reggie. They are a pure joy to have around. The one downside though to having three cats is that I now have three times the stink. Yes, our beautiful pets can pack a whole lot of odour into a small space. Reggie, our rescue kitten, is the worst offender. Who knew something so small and cute could stink up a room so quickly with one trip to the litter box? His stink isn’t as bad when he first arrived and he had a bad case of gas as he was adjusting to the new food. I think it’s the same as people – some just smell more than others! I’ve been trying different things to try and minimize the cat odour and wanted to share a few helpful tips that I’m doing to keep the stench under control. There is nothing worse than walking into a room and being hit in the face with the smell of dirty cat litter. It requires a little bit of effort on my part, but the results are worth it. 1. Find the right cat litter. I’ve experimented with different cat litters to find one that best controls the odour and is easy to clean. I also have to make sure my cats like the litter. If they don’t use the litter box, that defeats the entire purpose. Thankfully, my cats aren’t too picky about litter, but I know some cats are. I like the clumping cat litter for easy clean up. I also use one that has baking soda which I think helps control the smell. Since I have multiple cats, I look for cat litter geared towards multi-cat homes. 2. Use a cat litter deodorizer. I sprinkle a little bit in the litter box every time I clean it. I find it adds a boost of freshness to the box. When I replace the litter, I sprinkle cat litter deodorizer to the bottom of the box. It helps to prevent the litter from sticking to the bottom of the box. 3. Keep it clean. My cats love when I change the litter box. They sit there and watch me and then as soon as I’m done rush in there to be the first one to use it. Sigh. I scoop it out daily and replace the litter once a week. Some cats are fussy about their litter and will let you know if it’s too dirty by leaving a little “present” outside the litter box. I don’t want to test that theory out with my cats because no doubt they will also probably do that. 4. Place the litter box in a well-ventilated area away from their food. Cats don’t want to eat near where they use the toilet. I don’t blame them. Also, putting the litter box in an area that isn’t closed in will help to cut back on the smell. 5. Feed your cat good quality food. You know the saying, “Garbage In, Garbage Out”. It applies here too. Find a cat food that agrees with your cat and provides them all the nutrition they need. 6. Replace litter box once a year. After a year of daily use, litter boxes can become pretty gross. Princess is notorious for scratching the litter box and leaving marks on it. It’s nice to give them a fresh one to use after the old one has served its purpose. Disclosure: I received a sample for review purposes. Opinions on this blog are my own. 7. Purify the air with Lampe Berger. I’ve tried spray air fresheners downstairs where the cat litter is. It masks the smell for a little bit, but then the odour comes back strong. The only thing I’ve found to work to completely destroy bad cat odour is Lampe Berger. It purifies the air quickly and effectively. I have several Lampe Berger lamps around my home including one in the basement where our cat litter boxes are located. I light it a few times a week to freshen the stale air down there. Not only do they clean the air, but they also serve as beautiful home decor accessories. 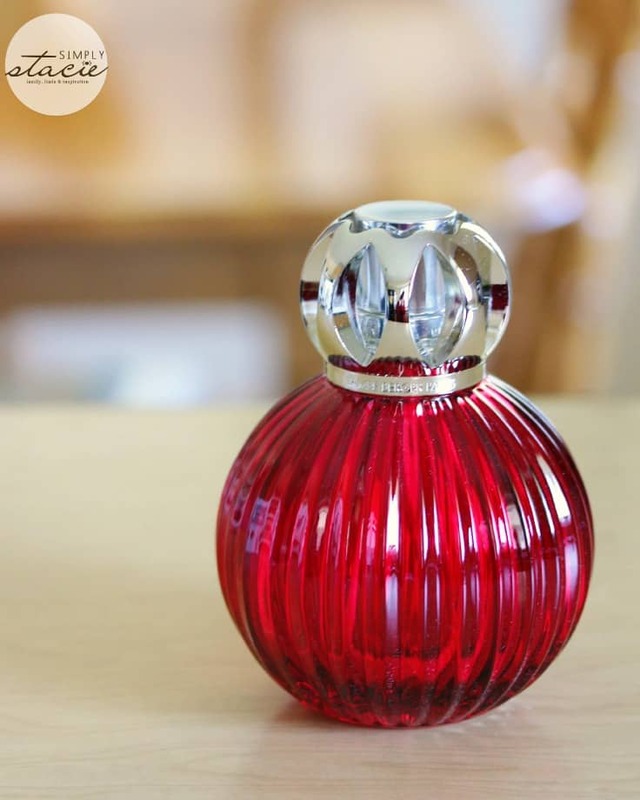 I received this red Lampe Berger along with a bottle of home fragrance. It’s so pretty! I’ve written a couple times before on my blog about Lampe Berger. In this post, I talk about how it works to freshen the air. Want to try out Lampe Berger? Find a store in your area that carries their products. You will thank me when your home smells 100x better! 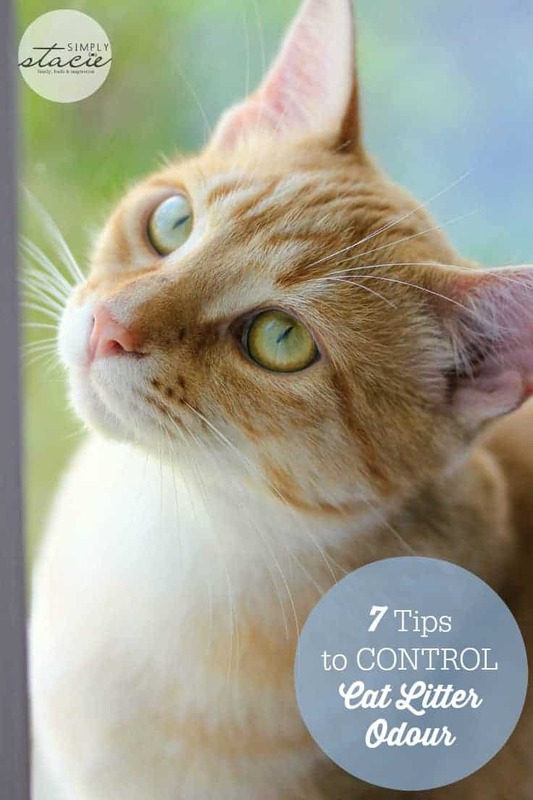 What do you do to control cat odour in your home? I would love to try Quadri plum. I love the Sphère smoked lamp and Orange blossom fragrance. I would like to try the Cherry and Orange blossom oils. I would like to try the Botania lamp. I would love to try the Pebble White as it looks like it would fit in every room of our place. I would love the Polygone white, so pretty! 2 cats here with one box. Always hard to mask the smell. I’m all about fresh linen everything! I like the Sweet Bubble smoky grey lamp…. Would love to try winterwood… it sounds lovely. I like the flowery scents. Love to look of Pebble White. Would love to try this one! The scent I would like to try is Fresh anis of greek islands. I like the Ellipse Leopard Lamp! I would like to try the Vanilla Gourmet fragrance. Orange Cinnamon sounds like such a nice fragrance.